We left Carrion de los Condes at about 7:30 – Jessica woke up in pain, she rode her bici slowly, but the pain did not go away, we stopped often but after about 20 KMs we stopped in San Juan de Sahagun and got some fruit to eat hoping that maybe her pain would go away. We tried riding on but decided to have a short ride today. In Sahagun we decided to see a Doctor, after searching for about half an hour and some help from the locals that could not locate the emergency clinic till they themselves asked several times. I had gone on to find the clinic myself, as Jessy stayed at a church to rest from the pain. Once I found the clinic I came back for her and we slowly rode the bicis over. We walked in and I explained that we were peregrinos and my daughter had a pain, they asked for her passport, they made a couple of copies of it and within minutes the doctor saw her. Jessy was checked in her lower stomach and the doctor ruled out appendicitis because her pain was on both sides of her lower stomach, he had Jessy go to the bathroom and pee in a cup and then dipped a strip to check it out and thought it was a urinary tract infection. He wrote up a prescription and we went a few blocks away to buy the prescription powder and she took it right away, the Doctor felt it would go away in a couple of days. We had absolutely no fees for the doctor’s visit because we had foreign passports and paid just a few Euros for the Medicine. A few hours later Jessica was feeling better. That day would be a day of rest, we found the Refuge Monastere Santa Cruz and walked in after the initial wave of peregrinos finished with their days walk, we were told to go find a bed and we would pay in the evening when the staff returns. We get cleaned up and decide to walk around town, but also in this town they are putting up barriers a la Pamplona prior to the running of the bulls. Sure enough, there are fiestas this week and tonight there will be a corrida. In the Albergue we met a lady from Majorca who is cooking dinner; she tells us that she cooks dinner every night because the food is either not very tasty or too expensive. She shares her pasta with us, and we go out and buy corn and a can of squid to put into it. Also that night I decide to buy a bottle of vino tinto, I thought I would not drink it all and I will share some with other peregrinos. Sitting around the common dinner table we share food with others and I share my wine with a guy from Belgium. At about 7pm we head outside for the bulls run, it is just outside our albergue. I said to myself, will I run? This may be my only chance ever to run with the bulls. I may not get this opportunity again. So as the hour neared I went down the road to where the bulls would come up. I waited with nervous anticipation, I talked to few locals and they explained to me the different types of bulls, which one will go after you, which ones will just pass you by, which were slow, which were more dangerous. Now almost 7:30 – I’m one of the oldest guy there, most are in their 20’s. They are stretching, they are practicing zigzagging up the street, I’m trying to process in my head and come up with that they are practicing running around people as they fall on the road while we run. As I wait I talk to few others people when one other peregrino points out to me that it is mostly towns people running, that they are fresh, that they have not been out of the Camino putting in miles that day. I think a little more, should I be here, but I think back to my bucket list – What would Ernest Hemingway write about me, - He didn’t run because he was tired, what a wimp – No backing down now, maybe I just won’t let the bulls get that close to me, plus I already had my escape route planned. Jessica was around the corner with camera in hand ready to take dads photo as he ran up the hill and around the bend. The first gun sounds, I’m ready, I’ve stretched, I’ve zigzagged, but I’m told it will be 3 shots fired before the bulls are released. There are a few guys I talked to, they are still giving me advice, telling me about the dangers in the streets. They asked me if I’m going to run all the way to the bull ring, they want to know if I will step into the bull ring later with the bulls. I tell them I have to think about it. The 2nd shot is fired one guy is pretty drunk; the others are telling me that he is foolish, so I stay away from him. Finally the third shot goes off – within seconds I could see the bulls headed up the hill they are about 70 yards away. I’m thinking I’m pretty fresh, I only rode about 20 Kms today. The bulls are now about 30 yards away, I start to quickly walk up the hill and ready to make the turn at the bend, now it is 15-20 yards, everyone takes off running, I start running hard, all I can think of is the photo shot. I make the turn and I’m running as fast as I can. I’m running straight to Jessy and the camera, I don’t look back, if I do I may run into another person and go down. I run straight to Jessy, I want her to see dad smiling even if I get gored, she will see me happy. I reached up for the barrier so hard and fast to climb out of the way that my hands and feet reach up high, but my foot slips, I hang on not knowing were the bull is. There is not time to look back , just climb. I make it to the top and the bulls go by. What a rush, I’m OK, my first bull run; it happened too fast I need to do it again. But as I get down from the barrier I have a lot of pain in my ribs. When my foot slipped I held on so tight that I pulled my rib muscle on my right side, the pain was hard, but I tell myself, you are nor bleeding, you have to do it again. So down the hill I go, there will be another 2 releases, this time it will be the young bulls, the crazy ones, that will be more aggressive. I go down to make a second run, most of the guys go back down, a few others run ahead with the first bull (an older bull) into the bull ring which is about 200 yards away. I decided I needed another run, what if Jessica didn't get the photo. This time I was a bit more scared, in pain. My brain is going a thousand miles an hour, what if I get hit by the bull, what if I get gored? Oh well, maybe a couple of days in the hospital, it’s not that crowded of a run now, I won’t run into anyone, I should be OK. I let the bulls get a little closer this time, but I have my exit, this time I climb up the barrier without slipping, but in lots of pain from my ribs. I’m now thinking I cracked a rib, but I didn’t hit it against anything. I’ll be OK in the morning. I go down for the last run, but my rib muscles start to tighten. I try to stretch it but it hurts worse, and three more bulls to go. I’m an expert by now. I make the run and I decide to go back down, in between the second and third I saw a guy on the ground bleeding. I go down to see how he is. It was the guy that was drinking, his face is all bloody, and he was being tended by paramedics. They tell us that he was not hit by the bulls, but when he fell running he hit his head on the cobblestone street. He is out of mainly from the drink I think. All the runs are over, I head back up to find Jessica but cannot find her, I walk into the albergue, but she is not there. I thought maybe she went into the bullring, so I head up there. I walk in slowly, it is very crowded, the town was there, and all the peregrinos are there. I looked inside the bullring for her, but can’t find her, so I walked around to the sun side seating. Finally after about 10 minutes of looking I spot Jessica right by the entrance sitting in the shad. I went to sit by her, she filmed some of the guys down in the ring as they messed around with the bulls, men were now running at the bull and barely running or dancing around it, one guy would even jump or do a flip over the young bulls. I wanted to go down into the ring and play around with the bulls, but my rib muscles were tighter now and I felt I could not maneuver away from the bulls. All young bulls were given about 5-7 minutes on the ring to mess around with the people, after seeing 3-4 bulls go through the procession we left. 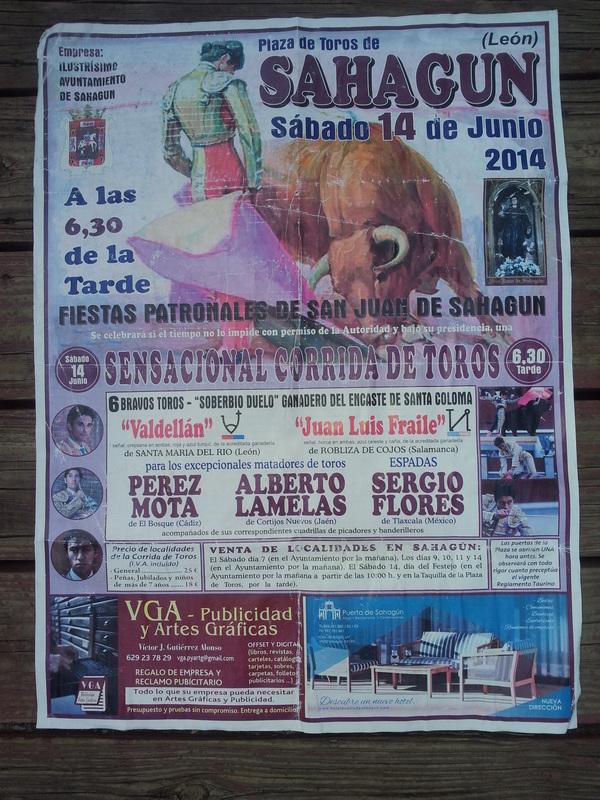 We picked up a couple of ice creams just outside the bull ring when I saw a poster announcing the Fiestas and the corrida, so I ended up taking the poster to be framed later at home with me running from the bulls. Later that night we went back out on the town and ran into the guys that I had talked to prior to the run. As soon as we sat down to talk to them he showed me his scar, he was barely grazed by the horns from about his waist to his lower chest, I gave him a high five telling him that it was the ultimate souvenir, just a little contact without any harm that would have taken him to the hospital. As we sat around talking, the bartender told us that the prior year a peregrino was killed by an oncoming bull that he could only see through the lens of his camera and the year before that a 22 year old peregrino was killed as his head hit the road while running away from the bulls. If the stories were true or not, we were thankful that we were all sitting at the bar and not in a hospital taking care of injuries. We went back to the albergue around midnight but did not get much sleep as that was the time the fireworks started, there was a concert that stated at half past midnight , but we knew that we would be up by 6 and we needed a little sleep. That night I did not sleep well, I had a hard time sleeping, It hurt to breathe as well as to make any movement. I had nightmares about having to stay in the town in the hospital due to broken ribs.